Ah, swimming, surfing, sailing, strolling and sitting in the great outdoors. We love summer! But it’s also the season for bug bites, sunburn and the rest. 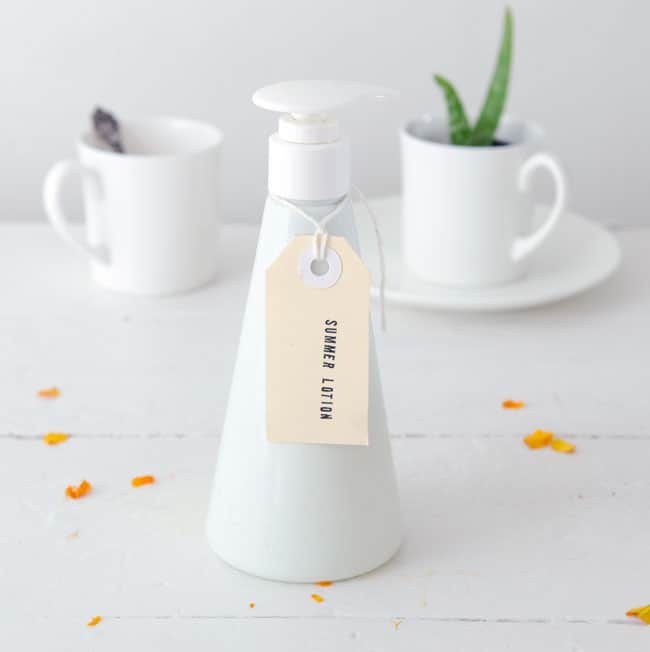 Cybele, a beauty therapist and aromatherapist from Blah Blah magazine, whipped up this light, soothing lotion that’s a lifesaver for summer bummers, like forgetting the bug spray or being caught out in the sun for way too long. 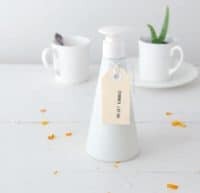 From Cybele: This homemade lotion is a great moisturizer, especially if you tend to be a bit sensitive. My hands can get a bit irritated when I wash them a lot, so I now use this as a hand lotion, too. However, for rashes and reactions, it’s important to follow the advice of your healthcare practitioner. Regular use won’t suit everyone, because the lotion leaves the skin a bit tacky to touch when first applied. This is actually a good thing, as it means the lotion’s staying in place to penetrate the area from the surface down. This anti-inflammatory and healing wonder of a plant is bright yellowy-orange because of its high carotenoid content, which makes it an awesome skin regenerator (and why we love it in diaper cream). It’s also easy to make your own calendula oil, too. Aloe Vera is amazing at soothing and cooling. It’s also thought to speed up healing by increasing the amount of collagen (the skin’s scaffolding) wherever it’s applied, according to this study. It’s important to buy from a good source, as all bottled aloe vera contains preservatives, some natural, others nasty. Raw honey is an anti-inflammatory that is thought to stimulate a good immune response, reduce infection and enhance healing in burns and other wounds. 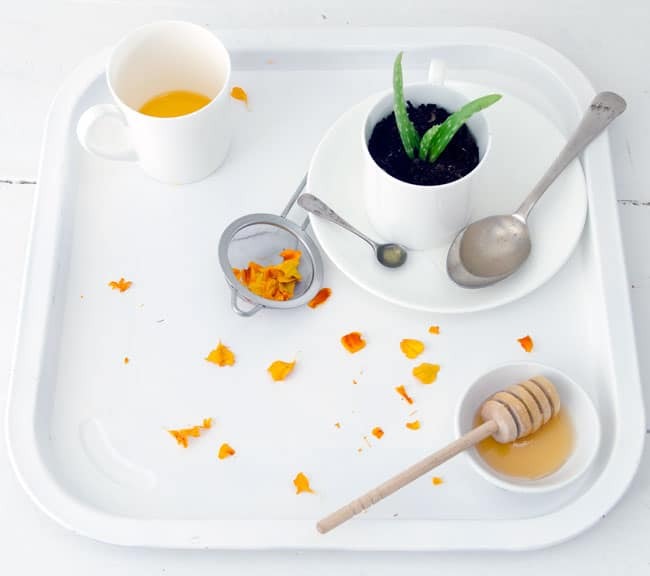 The manuka honey, harvested from bees that love tea tree flowers, is even more serious about antibacterial action. Chamomile shares a lot of its soothing, calming and anti-inflammatory properties with lavender but is thought to be a little bit gentler. The raw honey means this is not suitable for babies under one year of age. Bele Masterman can be found pottering around on Blah Blah Magazine. Once upon a time, she trained as a beauty therapist and aromatherapist and turned into a journalist, chronic DIYer, lover of beautiful things, mother of two bouncing boys and wife. What kind of Aloe Vera? Is it the Gel or the Juice, or maybe chunks of the plant? Cant wait to try this out! I bet this smells amazing! Love the idea of making my own lotion. Can you recommend reputable places to purchase these ingredients as I don’t know of a source. Could you substituted Coconut Oil for the Calundula oil? 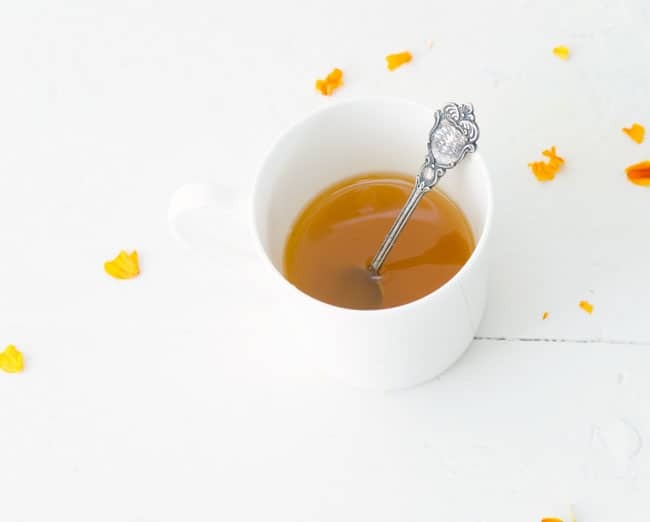 Calendula oil is an infused oil; you add the calendula (aka pot marigold) petals to any liquid carrier oil that you like. I get mine from PennHerb (dot) com. Aloe gel should be free from dyes and fragrances; Fruit of the Earth brand can be found in most big box stores. Raw honey can usually be found at your local health food store or online. They don’t specifiy whether it is German or Roman chamomile (I suspect Roman since the cream is white), but I use PlantTherapy (dot) com for essential oils. Don’t know if you’ll see this since it has been a while, but hope it helps.